There isn't a DSLR out there that records video that has what most of us videographers would call an "acceptable" audio ability. Even if there's flexibility in picking sound levels, the amps used in the DSLRs tend to just be noisy. And the microphones built into the camera? Mostly a joke, and highly prone to picking up any camera-handling noise. So we all look for "solutions" to our problems. I've been working on a review of one option, but while I was working on that I came across something that wreaks of "let's just solve both the DSLR problems directly." 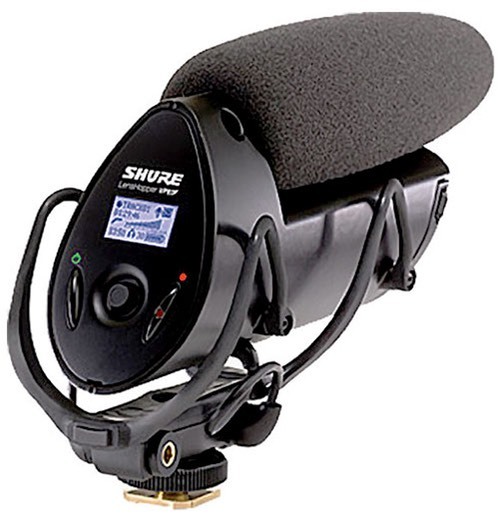 It's the Shure VP83F, a shotgun microphone with suspension that slots into the camera's hot shoe but has this little goodie up its sleeve: it records 24-bit, 48kHz WAV audio files onto MicroSD cards. Heck, it even has a headphone jack. So let's see: (a) better microphone, (b) camera handling isolation, (c) headphone monitoring, (d) in your face UI for audio while recording, and who knows what else? Sounds good in theory if all you need is one forward-pointed sound gathering device. After shooting with it, just use something like PluralEyes or the multicam options in many linear editors to align your separately-recorded audio and video tracks in post. Now I have no idea how well it works as I've not used the VP83F, but it doesn't have to go very far to top what you get out of a DSLR without help. Thing is, if recording video with a DSLR was all that important to the camera makers, wouldn't you think they'd come up with their own better solutions? If you want to order one to try out, you can find the VP83F at B&H (advertiser link).